Instant Karma! b/w Who Has Seen The Wind ? Detail : John's third solo single. On January 27th 1970 John wrote, recorded, and mixed "Instant Karma" with Phil Spector producing. The single was released just 10 days later, therefore being one of the fastest singles of modern times to be completed. 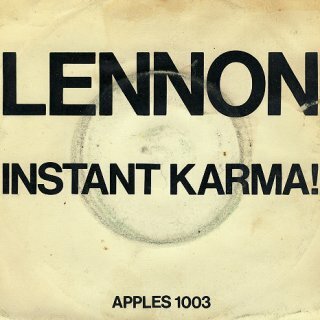 "Instant Karma" was this time credited to LENNON/ONO with the Plastic Ono Band, which on this occasion comprised, John, George Harrison, Klaus Voorman, Alan White, Billy Preston, Yoko and Mal Evans. Billy Preston also rounded up some late-night revellers from London's Hatchetts Club for the chorus. We got a rare treat in this country on February 12th, when John appeared on "Top of the Pops" to promote the record, the first Beatle to do so since 1966. While John hammered the piano, with an armband on his denim jacket saying "People for peace", Yoko was perched behind him, blindfolded holding up cards with simple inscriptions. "Instant Karma" was the first Beatle solo single to sell a million copies in America. 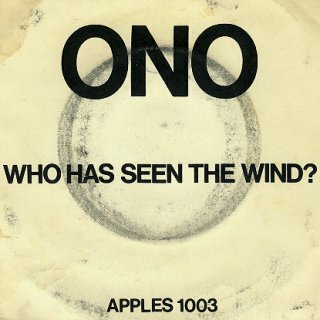 The B-side, written solely by Yoko was produced by John. The design of the label is exactly the same as recent Beatles releases on Apple with the addition of "PLAY LOUD" stamped in bold large letters across the centre.